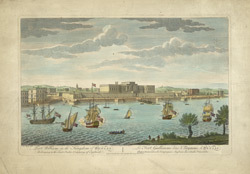 Coloured engraving of Fort William in Calcutta by Jan Van Ryne published by Robert Sayer in London in 1754. Calcutta was founded on the mud flats of Hooghly River, a tributary of the Ganges, by the English merchant Job Charnock in 1690. After 1696, Fort William was constructed under the supervision of John Goldsborough. It was situated near the bank of the river. As we can see from this view, the building had two storeys and projecting wings. In 1757, an attack on the fort by the forces of Siraj-ud-Daulah, the Nawab of Bengal, led the British to build a new fort in the Maidan. The old fort was repaired and used as a customs house from 1766.